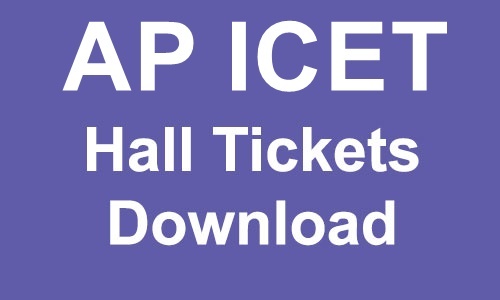 AP ICET 2019 Hall Tickets Download – Andhra Pradesh Integrated Common Entrance Test 2019 hall ticket/ Admit card available on its official website sche.ap.gov.in/ICET/. The ICET examination 2019 for Andhra Pradesh state is going to be conducted on 26th April, 2019. The students who have registered and applied for the exam are eagerly waiting for their Hall ticket / Admit card to know the allotted centers, date of exam and timing of the exam. The official link to download the Hall ticket of AP ICET has been activated and the students can get their Hall tickets/ Admit card by clicking on the link. Andhra Pradesh Integrated Common Entrance Test (AP ICET) entrance examination is scheduled to be held on 26th April this year. The Convener Acharya Sudhir has expressed to media on Wednesday about the AP ICET examination. As per the announcement, this year the AP ICET is going to be organized in 2 schedules. The examination will be held from 10 AM to 12.30 PM in the morning shift and 2.30 PM to 5 PM in the afternoon shift. As per reports, this(2018) year 52,216 hopefuls have applied for the ICET examination seeking MBA/MCA admissions in the state of Andhra Pradesh. The ICET admission test will be held at 101 examination centers across the state, as per the board’s announcement. All the applicants are advised to report at the examination hall before 1 hr of the examination. Candidates can check the examination center details from their respective hall tickets. Andhra Pradesh Integrated Common Entrance Test (APICET-2019) for the year 2019-20 will be conducted by Sri Venkateswara University, Tirupati , in accordance with G.O.Ms.No.25 Higher Education Dept dt: 09-04-2012 & amendments, for admissions into first year MBA and MCA courses offered in Universities and Professional colleges in Andhra Pradesh. Students can download ap icet hall ticket 2019 from below links from April 15th. AP ICET Hall Ticket 2019 to be downloaded from the official website of APICET. Hall ticket must be carried to the examination hall by each candidate. Sri Venkateswara University is the conducting the exam on behalf of APSCHE. The AP ICET 2019 admit card, also known as Test Admission Ticket, is issued for those candidates who have applied for the MBA and MCA entrance test. Complete details of how to download Andhra Pradesh ICET Hall Ticket 2019 and other information related to the admit card are given here. How to Download AP ICET Hall ticket 2019 online? The applicants can download their Hall tickets/ Admit cards by following the below mentioned process. Fill in all the details within the corresponding boxes. Take a printout of hall ticket. This is Second ICET exam conducted by Andhra Pradesh state after the bifurcation of Andhra Pradesh and Telangana. Until last year ICET exam was conducted by Kakatiya University for both Andhra Pradesh and Telangana students combinedly. But this year ICET exam is conducted by both the states separately. AP ICET 2019 is conducted By Sri Venkateswara University, Tirupati on behalf of APSCHE. For more details visit : http://sche.ap.gov.in/ICET/. 1.2 How to Download AP ICET Hall ticket 2019 online? Should we carry application form along with hall ticket to the exam center?